Checkered block designs detail the headboard and footboard of the Grove King 5pc Bedroom Group. The geometric pattern uses the collection's unique wood grain feature to create a dynamic bed. The bed's sleek, simple frame gives it basic shape with a black contemporary finish. The simplistic design with an innovative finish and grain pattern makes the Grove Bed a timeless design for the bedroom. 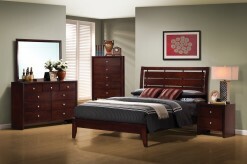 Furniture Nation is proud to offer the Grove King 5pc Bedroom Group online. We serve customers across the DFW region including Weatherford, Burleson, Lewisville and many more. 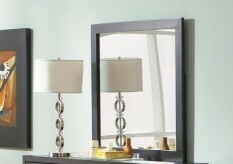 Grove King Bed : L78.75" x D83.75" x H50"
Grove Dresser : L59" x D17.25" x H35.5"
Grove Mirror : L59" x D17.25" x H36.5"
Grove Chest : L35.5" x D17.5" x H51.5"
Grove Night Stand : L23.5" x D17.25" x H25"